Having a proper deck at home gives you extra space for relaxing or socializing. Knowing how to build a deck is useful to improve your property and extend living space. From a poolside to balcony deck, this structure is great to create a lounging area or place to socialize. If you plan to build a deck, make sure to follow this handy guide. Corner deck is often used as a “filler” alternative for an exterior plan that does not have a specific corner space. You can turn the deck into an extension of the living place. Depending on the landscape, a corner deck can lead directly to indoor and outdoor seating areas. This deck is a variation of a balcony deck. Open roof deck is perfect for a house with a flat roof. You can create intimate seating or dining area while keeping privacy. Unlike the front yard decks, backyard desks may have more intimate and familiar settings. You can place a set of sofas, a spot for sunbathing, or even a fire pit for backyard camping. The layered design gives a simple deck more depth and dimension. You can also use the design to utilize small space, especially in urban areas. Breezeway deck serves as a connector between several buildings in one property unit. The raised deck can provide walkway and additional living space at the same time. If you have a large decorative pool, or live in a steep area, the floating deck can be a choice to extend the living space above the surface. The floating deck also appears at homes in high areas, such as the hills or cliffside. Destination deck is a term for deck that is built on the separate spot (instead of connected to the house structure). It is usually a ground level deck surrounded by features such as planters, flower beds, or garden paths. 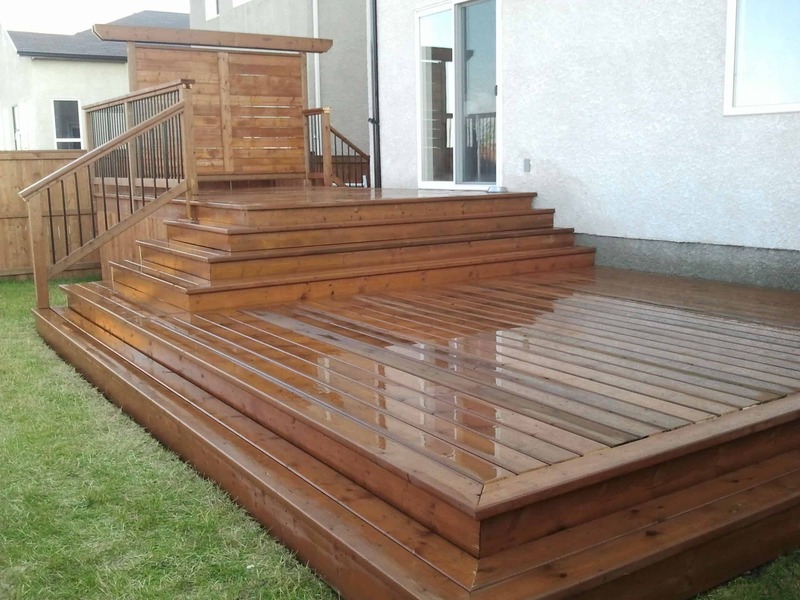 This deck is perfect for people with large yard. You can add any deck model you like based on the budget, house design, and needs. However, you need to follow specific building codes in accordance with regulations. If your house was not built with deck, you need to check your local building code standard about constructing one. The code regulates various aspects of a deck, such as the bearers, joists, supporting posts, thickness, handrails, paint jobs, and maintenance. Bearers and joists Australian standards, for example, must follow requirements based on the materials and sizes. Building codes usually include protection against local elements, such as the sun, rain, wind, and snow. You must coat your deck with the specific finish and paint types. There are also requirements about maintenance and use, including rules about flower pot placements (especially if you build balcony deck). If you live in a neighborhood, your deck should not violate your neighbors’ safety or privacy. Certified builder teams or contractors usually understand the building codes. However, if you want to build your own deck, contact your local government office to get the most current building code regulations. Cedarwood is a popular and cheap option for a deck. It has beautiful grain pattern and is easy to work with (even for DIY projects). Dark cedar is the best for deck because the lighter one tends to rot quickly. Pressure-treated fir is another cheap option for homeowners who have problems with insects. This material is quite strong and can last for many years, but you must have a proper maintenance program to prevent stains. Vinyl is a synthetic material perfect for a durable deck. It lasts for many years (up to 25 years) without difficult maintenance, and the surface is easy to clean. The composite material is a common option for those who love timber but want something with less maintenance. This material combines wood fiber with polyethylene, and it looks like a real timber. After the building codes, you need to conduct research about the size, weather, and soil characteristics. They determine the type of deck you can build, the materials, and the cost. Most building code regulations only allow 60 to 90 cm of deck height (from the ground). When building a deck, there are three types of set-outs: location, horizon, and vertical height. You must calculate the available area size, the length of deck extension from the main building, and the height from the soil. If you want to create an open deck (without roof or shades), determine the best orientation to get good amount of sun. The most ideal orientation is placing your deck in the east or north (or between them). This way, an open desk will get good sun all year round. When you pick any steel elements for the deck, choose the galvanized ones. They are rust-proof and providing better structural integrity. If your property is located near the sea (which means a higher risk of rust), use stainless steel. Don’t forget to check your deck joist spacing integrity using joist span calculator (available online). It is important to make sure that your deck can hold the load properly. A deck has several benefits, from extending your living space to improving your property value. It also provides extra space for relaxing and holding social events. Building a deck requires good planning, from the structural integrity to the materials and building orientation. Knowing how to build a deck will help you get the best of this structure, even if you order construction service and builders to do the job.